"THE QUARTET PLAYS EACH PIECE WITH DEDICATION AND FINESSE, DEEPLY FINDING THE ESSENCE OF EACH PIECE IN THEIR INTERPRETATIONS. EACH PLAYER IS AN ACCOMPLISHED, LOVELY PLAYER WITH GREAT SOUND AND SOLID TECHNIQUE, AND TOGETHER THEY CREATE A UNIQUE, VIRTUOSIC ALBUM OF QUARTETS. GIVE IT A LISTEN!" "CHAMBER MUSIC AT ITS FINEST." 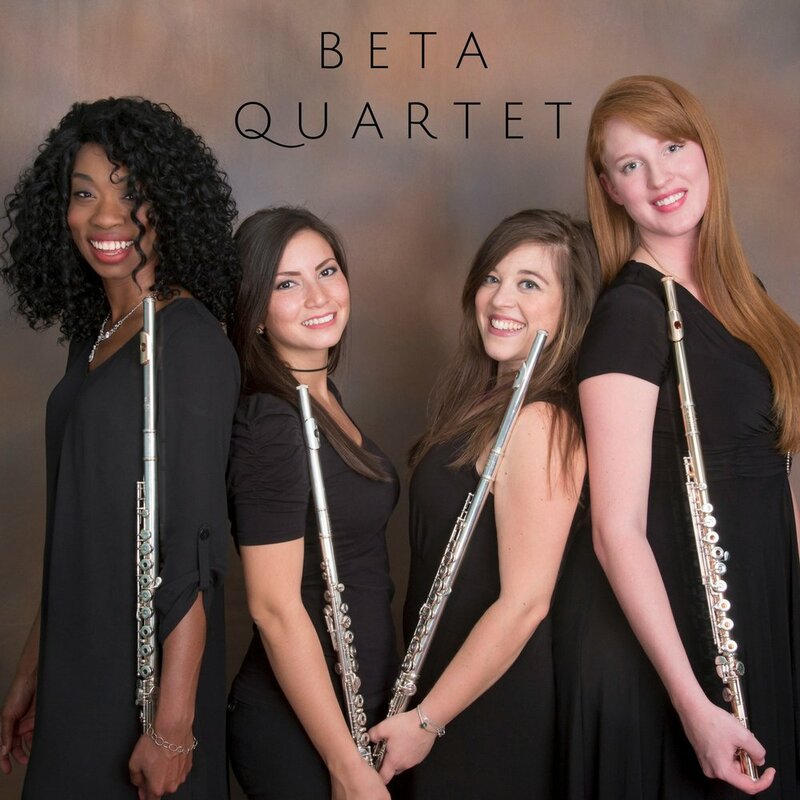 BETA Quartet is an emerging chamber music ensemble comprised of national and international prize-winning flutists Eftihia Arkoudis, Tatiana Cassetta, Alyssa Schwartz, and Meg Brennan. As advocates for new music, BETA is actively engaged in chamber music competitions and performing across the nation. As strong competitors, BETA has won First Prize at the West Virginia Music Teachers National Association Chamber Music Competition (2016), First Prize at the Flute Society of Kentucky Flute Quartet Competition (2017), and advanced to the semi-finals of the prestigious Fischoff National Chamber Music Competition (2017). BETA has performed and held workshops at the Florida Flute Association Convention (2017, 2018), the Mid-Atlantic Flute Convention (2017, 2019), the Flute Society of Greater Philadelphia Society (2017, 2018, 2019), and the International Flute Symposium (2017, 2019). In addition, the group has been invited to perform at the 49th National Flute Association Convention (2019) in Salt Lake City in Utah, which will mark their inaugural appearance at the largest flute organization in the world. Actively engaged in educational outreach, they have given concert tours and masterclasses in Florida, Detroit, West Virginia, and Greece. In addition, the ensemble’s activities have been financially supported by grants from The Friends of Flutes Foundation and West Virginia University, and their recognition within the flute community has resulted in Trevor James Flutes (London) and Flute Specialists, Inc. (Clawson, MI) sponsoring them. Your generous contribution will support our vision of promoting new music, engaging in educational outreach, covering artist fees, recording costs, and travel expenses to reach a widespread audience.